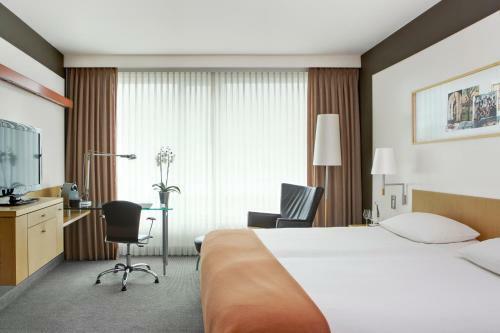 Offering soundproofed rooms a fitness room a sauna and on-site restaurants the non-smoking Sheraton Amsterdam Airport Hotel And Conference Center keeps guests comfortable at Schiphol Airport. The non-smoking 11-story Sheraton offers 408 soundproofed rooms with flat-panel LCD TVs minibars Wi-Fi hairdryers alarm clocks and safes. Choose from three on-site dining options for breakfast lunch and dinner. Room service is available around-the-clock. Work up a sweat in the fitness room and sauna or relax with a massage. Guests can check their email and print boarding passes for free in the hotel's lounge. Currency exchange is provided on-site. Concierge childcare and laundry services are available. Pets are permitted. Parking is available for a fee. Located at Schiphol Airport the hotel is 20 minutes from downtown Amsterdam. Guests can access Schiphol Train Station via an enclosed walkway. The hotel is less than 30 minutes from the Rijksmuseum the Van Gogh Museum the Anne Frank House the Flower Market and the Red Light District. The World Trade Center is 17 miles from the hotel. In the warmer months hit the beach in Zandvoort 30 minutes away. The iconic windmills at Zaanse Schans are 25 miles away.